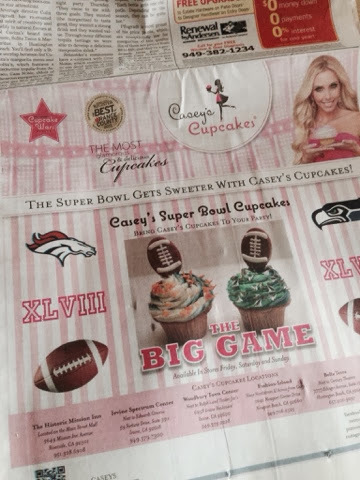 Wednesday morning I opened the Orange County Register newspaper and was greeted by an ad for Casey's Cupcakes. They were advertising their Super Bowl cupcakes that are available this week. I've never seen a cupcake shop take out almost a full-page ad before. Not sure the football crowd is the best group for buying cupcakes, but I could be wrong. I'm going to be making cannollis for out Super Bowl party. What are you making?